The local deals include Beauty, massages & spa, Things to Do, restaurants, Getaways & more. 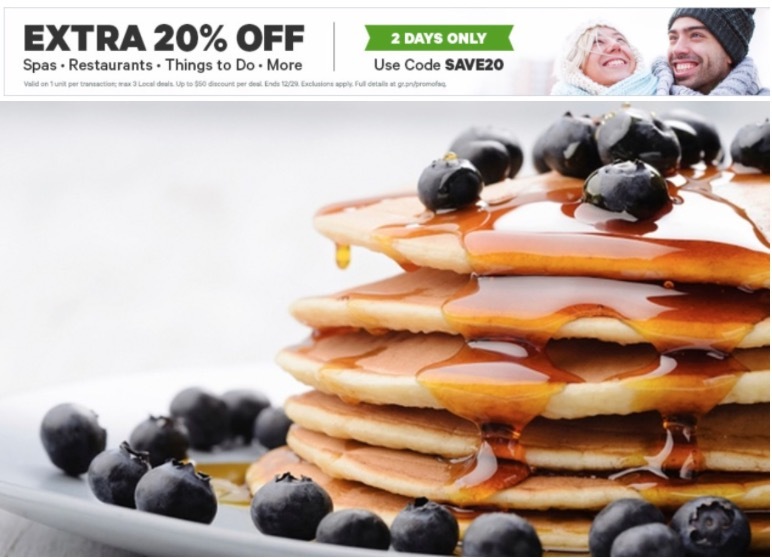 This Groupon offer is valid today, December 25, 2018, until 11:59 pm EST. To get your extra discount, enter the promo code MORE at checkout. Groupon Canada has a new offer available now! The Groupon Canada offer includes: save an extra 20% off local deals, Restaurants, Things to Do, Spas & more. This Groupon Canada offer is valid until December 29, 2017. To get your extra discount, enter the promo code SAVE20 at checkout. Groupon Canada has a new promotion available now that includes: Save an extra $25 off local deals that include Beauty & Spas, Things to do, Restaurants & more. This Groupon Canada offer is valid until December 24, 2017. To get your extra discount, enter the promo code WOW25 at checkout.